Regular readers will know that I am a big fan of Monkey World Ape Rescue Centre in Dorset and the TV programs about the primates that live there. The sanctuary was set up by the late Jim Cronin MBE in August 1987, which means they are celebrating their 30th anniversary this month! During this time they have rescued hundreds of monkeys and apes from abuse and neglect. 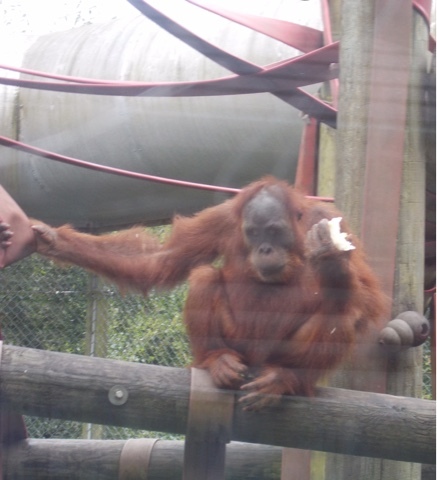 As part of the anniversary celebrations they are holding a Picnic 4 Primates on Monday 7th August at the park. They have lots of things going on and it sounds like it will be a great day out. I would absolutely love to go to this but sadly I think it will be way too busy for me and my anxiety to cope with. I will definitely visit the park again after the busy summer period though. The Picnic 4 Primates event it open to everyone (normal admission costs apply) simply go along on Monday 7th August and enjoy a fun day at the park, with lots of extra games and activities- as well as the chance to see some of your favourite characters from TV's Monkey Life! Bring your own picnic, or buy one at the park, and join the Monkey World team for the biggest picnic ever in the park, all in aid of raising funds for the primates. With fairground games, a 30th anniversary trail, and 30 year goody bags available to buy, it's going to be a great day out! I really hope that this event goes well for Monkey World and that they raise lots of funds so they can continue their amazing work rescuing and rehabilitating primates from across the world. Monkey World is a magical place, it is definitely worth visiting and it is also great for disabled visitors as I discovered during our visit in June. You can read my review of Monkey World here. Congratulations Monkey World on your 30th anniversary, I hope you all have an amazing day.